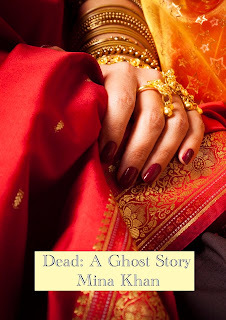 My one and only NON-romance, DEAD: A GHOST STORY, received another 5 * review and left me feeling warm and fuzzy and giddy. Writing outside of your usual genre takes courage. You are afraid of disappointing your readers, you are afraid that your writing may not be up to the new challenges, and you are afraid of taking a leap into the unknown. However, DEAD was inspired by the immigrant women who often live and die in the shadows, it's about abuse and heart break, and it's about freedom and hope. I discovered this work by recommendation of Grace, who knows the writer. Never discount the word-of-mouth referral, because this is one of the best stories in any genre or any language that I've read in the last six months or so. Worldwide, ghosts are unfinished business, and Nasreen is no different. Without spelling it out, Mina Khan teases us with many expected ghost-story tropes (the jealous first wife, the murdered innocent, the heartbroken ghost forever bound to its place of death) before unraveling the knot into an unexpected sensation of lightness and liberation. Meanwhile, back in the world of the living, an implied noir tale unfolds after the credits roll. Brilliant work, all around, with a storyteller's voice that is simultaneously invisible as water (or wind) and a personality of its own. Brava! I look forward to more work from Mina Khan, and right now am off to buy all her other books! I don't know who you are E.P. Beaumont, but thank you. Your reading my stories and taking the time to share your reaction is priceless. Your words made my day. All those hours spent agonizing in my head and sweating blood onto paper as I try to pull a coherent story from the vivid chaos that is my imagination is worth it when I know my stories are connecting with readers. So thank you for sharing.